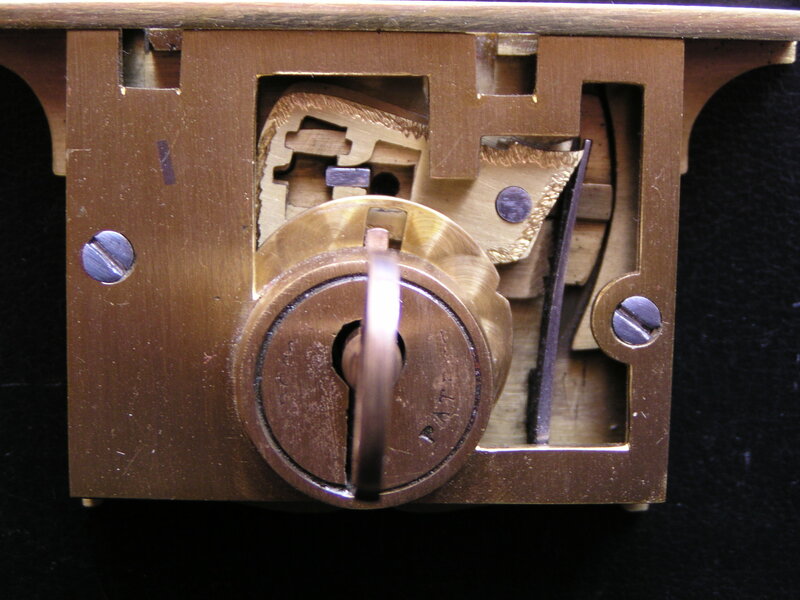 In August 1865 a Patent was granted for a new design of high security lock. (Patent No. 2198 of 26th August 1865). The inventor was Edmund Dorman Hodgson, who was probably a lawyer, as his address was given at 5 Paper Buildings, Temple. London. 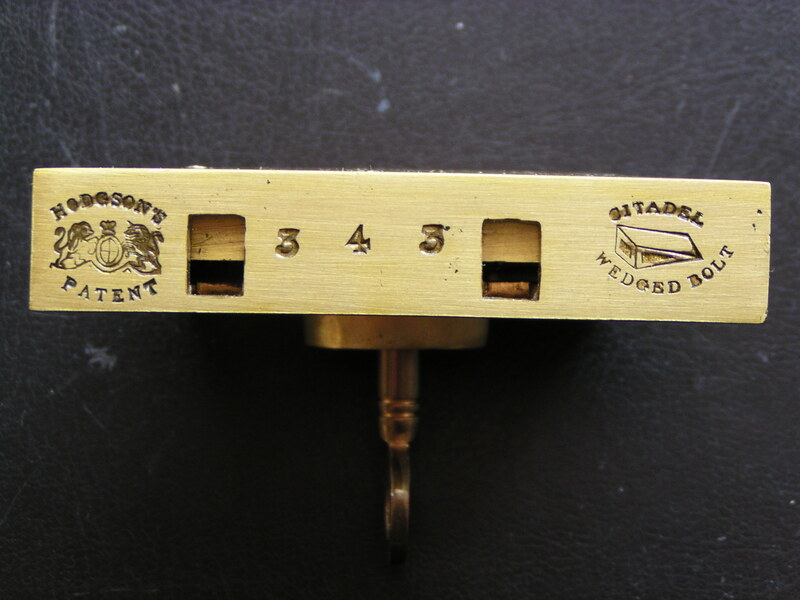 Also the fact that his design locks were made in Wolverhampton by James Hodges suggests that he was not a 'hands' on' man. The vital improvement incorporated in these locks, was the use of a second steel plate (lever) riding beneath the bolt lath, but carrying a massive second bolt stump with saw teeth notches. The back end of the main bolt lath, or tail, has a wide gating cut into it, while the remainder has saw teethed notches which can exactly mesh with those on the steel lever. In action, the key will lift the lever pack to the correct height, at the same time disengaging the secondary lever with the saw teeth from the back of the bolt tail; the main bolt is then thrown out and finally the saw teeth re-engage. Thus when locked, it is useless to apply pressure to the end of the bolt, or by means of picks through the keyhole to the bolt talon, in order to bring the main bolt up to the lever pack, as this pressure is referred back to the Citadel wedge bolt and this, on the opposite side to the saw teeth, backs off against a massive curved steel plate, securely fixed to the lock back plate. The action of this lock bears a striking resemblance to John Tann's "Reliance" patent, as here the pressure is taken off the main bolt stump by an independent secondary lever, acting below the bolt lath. I would suspect that in terms of strength, the Citadel would be the stronger device. Here below is a photograph of an "Orbicular" (in the form of an orb, or circular) padlock with the mechanism having the wedged bolt design. 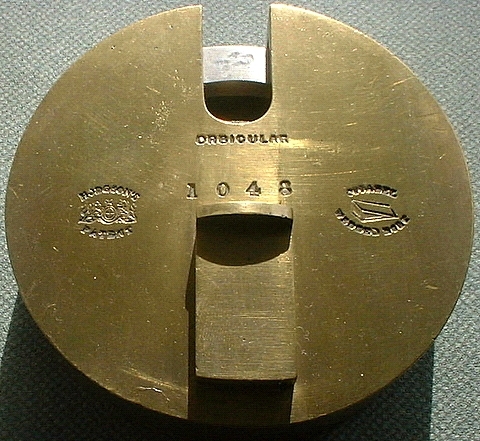 Below are two photographs showing a safe lock incorporating Hodgson's wedged bolt design.